Dish, aka Bob's Dish, is a 7½-year-old black female born June 1, 2010. Her sire is Rythmless and her dam is Bob's Diva. Dish has 90 races on record at greyhound-data.com, all at Gulf Greyhound Park. She started her career on March 4, 2012 and her last race was on October 18, 2013. 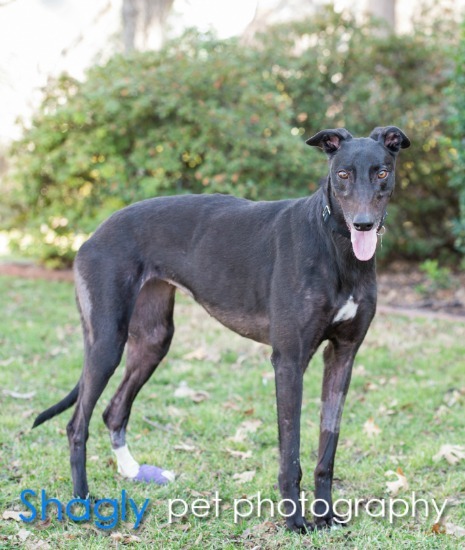 She retired to come to GALT upon sustaining a compound toe fracture on December 11 – the toe was amputated and she is fully healed up. Dish was in a home for several years, but has returned to GALT due to a change in family circumstances and no fault of her own. Dish is not cat trainable. If you're looking for a low maintenance dog, then Dish is the girl for you. 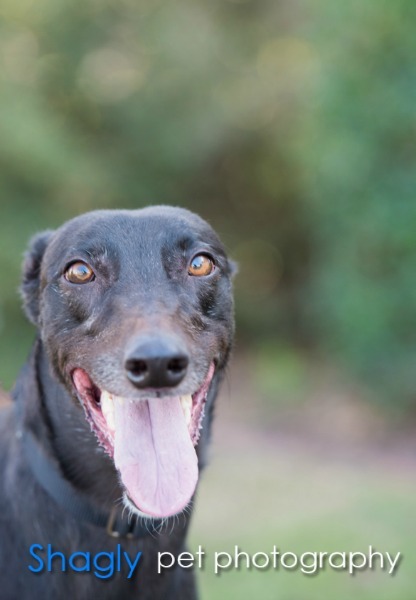 She would be great as an only dog, and gets along greyt with her greyhound housemate; she also did well with all the dogs at meet and greets. She is completely house trained and goes out of her way to locate me to tell me when she wants to go out. She is very affectionate and gives lots of kisses, greets me at the door with a wagging tail, chatters, leans and will accept petting whenever and wherever. Dish is not a Velcro dog and is very comfortable being left in a room by herself. She crates, but doesn’t need to be. She doesn’t get on furniture, beds, counter surf, bark or run up the stairs (but knows how to climb stairs when coaxed). She likes to do zoomies and spins; loves playing with squeaky toys, though doesn’t destroy them; likes to play with tennis balls and will chase the ball as long as you want to throw it. She sleeps through the night and likes routine. She walks well on a leash with no pulling and is content to keep pace with my other grey. She is very food motivated, though not at all food aggressive, and loves feeding time - her food is hers and anyone else's food is hers too if they don’t finish or walk away. She loves soft beds and laying in front of a fire. Dish is a great companion.